This post expands on my post at RingLead.com: Six Marketing Automation Principles to Keep Your Data Clean. Many marketers who are new to marketing automation suddenly discover their success on the job is directly affected by databases that seem out of their control. CRMs have data that is imported by salespeople, interns, hand typed, etc. That one hot shot sales director you poached from your competitor? He brought his “personal” list over and uploaded 5,000 records with no Lead Source, few Emails, no unsubscribe, no lead assignments, and uploaded it all without permission. Almost always this data is not imported correctly or with consistency. It is just there! But you can take control. If you want your job to be successful with marketing automation, you must take control – and take responsibility – for the data from Sales. (and sometimes your CRM managers). You need not worry, you can do this and do it well with the principles of data cleanliness. Marketers I have worked with have a familiar refrain: “Sales, Leads, and Other People are always importing bad data into the CRM.” When I look at their CRM and Forms, the most common root cause of these errors is the design of the system. Simply design your workflows and access levels to encourage certain behaviors while blocking bad behaviors. This is the first principle because the others rely on system design. How do you design the system to make behavior work for you? Let’s try a few common CRM tools at your finger tips. Picklists ensure that your field values are completely static and controlled by you. The user or lead gets a choice, but the spellings are always precise. Common fields to use these on are: Country, State, Lead Source, and Lead Status. For countries and States, I use the ISO Country List. Even within Marketo, you may want to restrict junior or inexperienced staff from importing lists. The most well intentioned user can create havoc by not following procedures. With a marketing automation platform (MAP), always import into the MAP, never into the CRM. Of course there could be exceptions, but only an administrator would really know when those should occur. Another design principle is to use picklist fields and free text fields at different times. For example, Role is a picklist that you might put on a form early in the buying process. Later, or in a progressive form, the Title field would appear. The reason I like this two-part data collector is that Role is easy to just choose. Titles vary widely and are for most people’s vanity. Lead scoring and other routing based on free text fields has to take into account a lot of options. Why not avoid issues early on? The field that comes to mind is Description (in SFDC) or “Notes”. This field was intended to be for either the Lead to fill out some detail or to provide a scratch space for Sales. Instead, it is often used to put in call notes and the history of the Lead. Do NOT permit this to happen. Sales absolutely must use Tasks or Meetings to log calls, even voicemails or emails. These records are stamped with time and date and have appropriate fields to help track Sales’ interaction with the Lead. Tasks are also a great way to tell Sales what Marketing is up to. Thus, a field like “Description” is best used as a temporary field for handling data that will be passed to a Task or a “Comments History Field” [see instructions]. The use of automation rules to correct common misspellings or missing data goes back to the 1960s and early principles of data quality when direct mail errors could result in thousands of dollars wasted. Today, data quality mistakes ruin reputations far faster than a misdirected mail piece. Email reputation, choice of language, and customer experience matter and they matter more because mistakes can go publicly viral in minutes. Save your firm’s reputation with automated data cleansing. These data management flows are one of the first things I setup in Marketo. Most firms setup these flows to start. State Corrector or Mapper – often helpful if you have Country and Inferred State. Email Invalid to Email is Good if the Email changed. 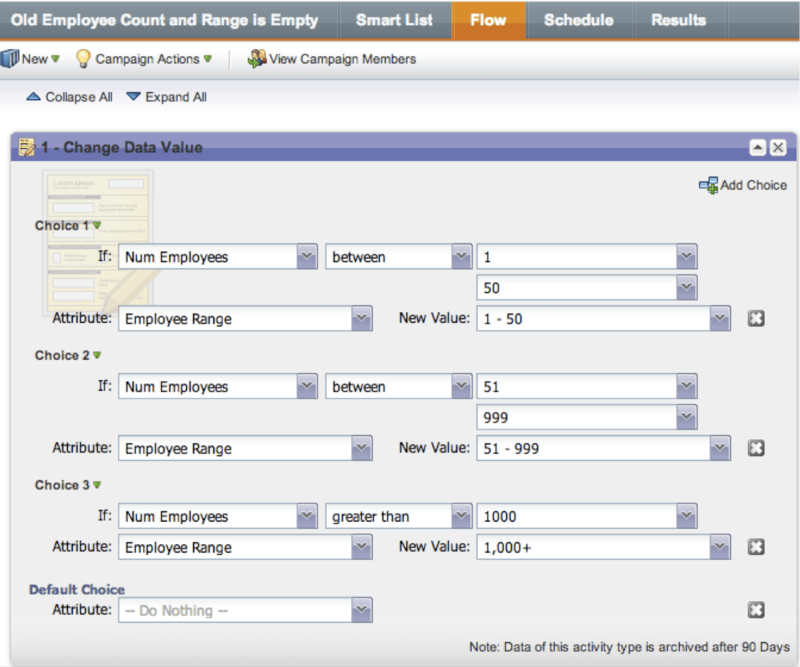 For example, this flow adjusts Employee Range based on Employee Number. Your system can include tools from the Appexchange such as Dupeblocker or RingLead to stop a user from entering a duplicate at that very moment. If you get the settings right, this should discourage salespeople from just entering data without thinking. Then you should run a deduping process over your entire CRM before you connect your marketing automation platform (MAP). You will thank me later. Most marketing automation firms offer a cleansing service (including Marketo), but you can ask other firms for help. If you have an SFDC Admin, they will know the tools and services to help you dedupe effectively. Usually this involves DemandTools, if your company can afford it. This cleaning process includes a monthly or quarterly review of the MAP+CRM. You will want to bring your team into a room, with laptops, and with pizza. Spend an entire Friday afternoon doing this and life will be better the rest of the time. Assign one person to each area at the start, and then go from there. 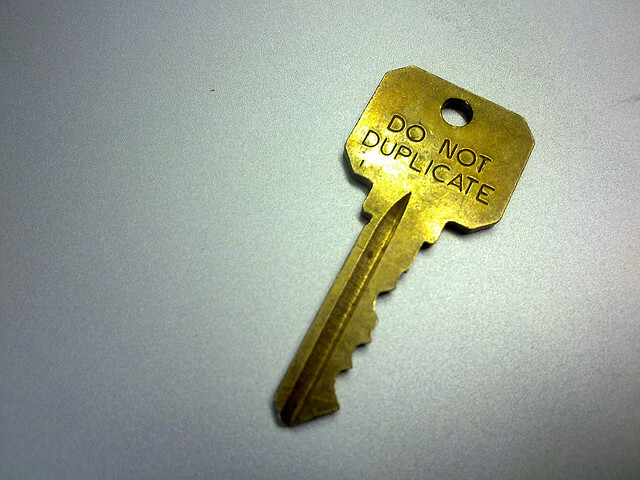 Duplicate count review: find out who is doing this and clean it up. Asset Cleanup: turn off or archive old emails, landing pages, workflows, programs. Marketo does a great job of allowing archiving to retain data. Also, team members should delete tests and other items they no longer need. Workflow Review: are the right ones working properly? Empty Value Counts: review records that are still missing key data: Country, Employees, Annual Revenue, Industry, etc… whatever is crucial to determining customer fit, scoring, and MQL status. You will always have leads without key demographic data points. These leads could be interested, but if you do not know they are in your target audience, you will never pass them to Sales. Nor should you! Form Based Autofill with ReachForce, for example. These tools ask the Lead to confirm if they are at a specific firm. The Lead confirms and the system autofills geographic and firmographic data automatically in the background. Backend Autofill: these services are similar to Hoover’s, DiscoverOrg, RingLead, and ZoomInfo. Their integration or service backfills missing firmographic data based on your rules. This happens in the background, but the Lead never sees this. Often, firms use both front end and back end appending tools to cover as much of the data gap as possible. Whichever one you prefer will help you improve segmentation capabilities and reduce the number of unaddressable Leads. New to marketing automation? Learn more about MAP administration strategy with my webinar with RingLead. View Now. Great suggestions! Many of which you’re helping us implement as we speak! Thanks Linda, glad to hear it! Great write-up, Josh. Definitely agree and we’ve just gone through a lot of these internally in our own Marketo implementation. At NetProspex, we also work with customers everyday to hygiene, improve, and focus their database to ensure better ROI from their automation platform.